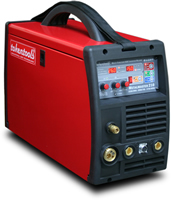 Tokentools welding supplies sell mig welders online and recently we introduced the Metalmaster 210D. The machine features DC MIG / DC MAG, DC LIFT ARC TIG, DC MMA ARC with reversible polarity for gas and gasless mig wire use, a 3 in 1 multifunction welder. The Metalmaster 210D can bu used for aluminium welding also. The constant voltage and constant current power source is made possible by a high efficiency 25 kiloherz IGBT quad core inverter matrix and the wire drive is smoothly driven by a pulse width modulated controller which features twin rollers enclosed within a metal gearbox. Other benefits are the push button mode selections, the ability to save presets into memory, automatic current throttling that cuts in at 210 Amps, digital volts display, digital amps display, over 120 voltage selections in 0.1 volt increments. When MIG welding current exceeds 210 Amps the digital microprocessor control unit throttles the current back such that spray transfers may occur with consistent results. The mig welding machine features push button activated wire feed and a twin gas solenoid manifold for automatic control of the shielding gas to MIG or TIG welding torch. When TIG welding simply connect the included TIG torch and press the push button trigger to activate the power output, you are then ready to perform lift arc TIG welding operations. This model also allows for the use of a remote foot pedal that can vary the amps on the fly whilst TIG welding. A large capacity fan ensures years of high duty cycle operation. Operation is quite simple and straight forward via the easy to use control panel and the steel case will provide superior protection against accidental bumps. All IGBT transistors are manufactured by Infineon, chosen for their ability to provide dependable power in the toughest of environments. We believe this machine is the ultimate unit designed for precision MIG MAG TIG and MMAW applications for all weldable materials being offered at a price point that is affordable and a warranty that is market leading. Thanks for the info about mig welders online, did you get a chance to look at my blog? This Mig welding machine is seems a best example of modern technology, and online marketing and purchasing has changed the whole scenario of business, we can buy or sell any thin with in seconds. This Mig welding machine is seems a best example of modern technology, and online marketing and purchasing has changed the whole scenario of business, we can buy or sell any thing with in seconds.